Measles is a contagious disease that causes high fever, cough, runny nose, and red watery eyes. A rash of tiny red spots breaks out 3-5 days after symptoms begin. Measles can progress to pneumonia, brain swelling, brain damage and death. There is no treatment for measles, but there is a way to prevent it. The combination of measles, mumps, and rubella (MMR) vaccine protects you and helps stop the spread of the measles virus to others. When more than 95 percent of people are vaccinated against measles, the disease slows down and doesn't spread as easily. Community (or "herd") immunity happens when enough people in a community are vaccinated against measles that it protects individuals who are not vaccinated or immune from measles. The best way to protect babies under 1 year of age from measles is to ensure that individuals around them, including family members and caregivers, are vaccinated. One dose between ages 12 and 15 months, and the second between ages 4 and 6 years. 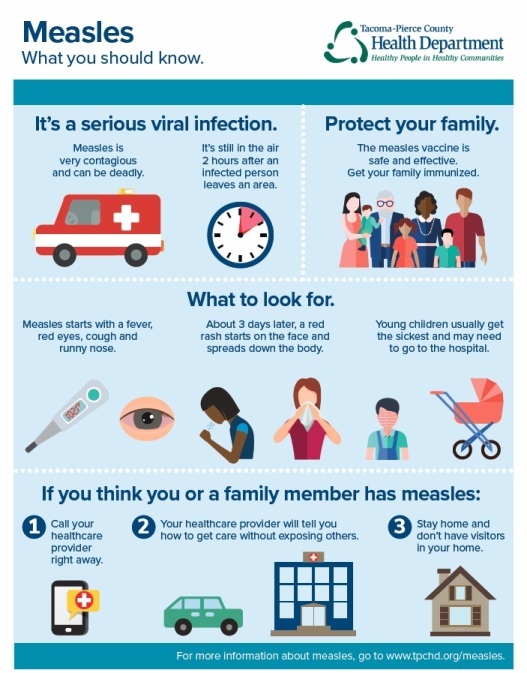 If your family will be traveling outside the US or to an area with measles, please contact your healthcare provider about the best way to protect yourself and your family. Adults born after 1956 may need an MMR vaccine if they have not already had it. Talk to your healthcare provider about the best way to catch up on your vaccines. Talk to your healthcare provider to get the MMR vaccine for your children. Washington provides MMR vaccines at no cost for kids through age 18, and they're available from healthcare providers across the state. Providers may charge an office visit fee and a fee to give the vaccine, called an administration fee. However, if you can't afford the administration fee, you may ask your provider to waive it. Click here to go to the Washington State Department of Health's frequently asked questions page. CDC - Frequently Asked Questions about Measles in the U.S.